Desolation, thy name is the Midwest…especially during the winter. Seriously, this place is a freezing ghost land of skulls and souls when the heavy snow begins to fall. Tree branches snap off. Fields die. And the land gets blanketed with thick drifts of snow which makes travel all sorts of difficult. And that, with just a hint of small town civilization, is the barren landscape of this low budget tale of cops and robbers. 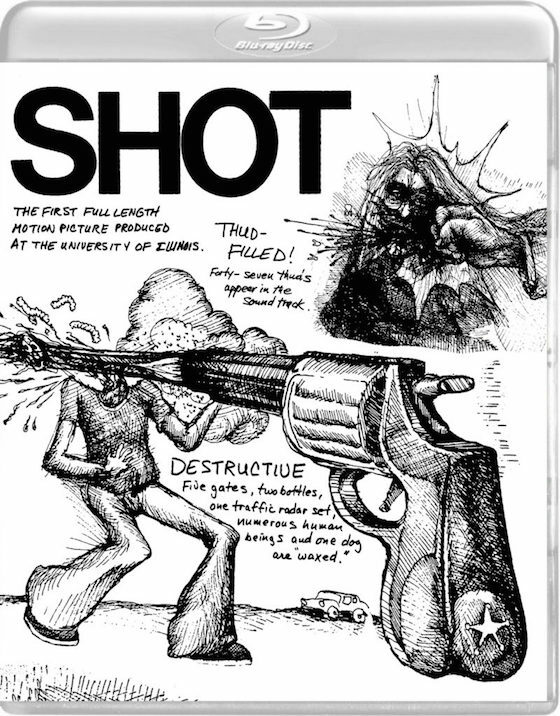 Shot, a student film from 1973, deserves to be envied and Vinegar Syndrome knows it. Think of Heat without a budget (and the talent pool of actors) and you get the nub of this ambitious showdown. The film might stumble with its choppy edits and laborious pacing, but none of that keeps it from being damned impressive. Some of the aerial shots are downright stirring. You can’t help but wonder how it was done on its $15000 budget. 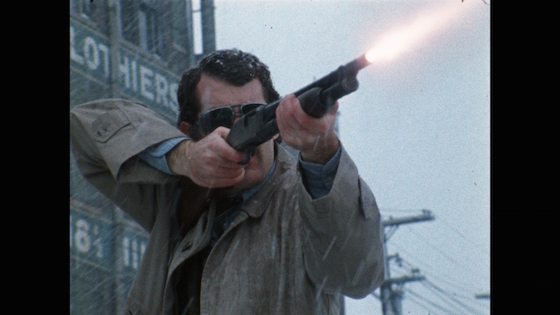 "Shot rises above being just a simple curiosity item thanks to its earnest showmanship. When it comes to student films, this Shot rises above the rest." 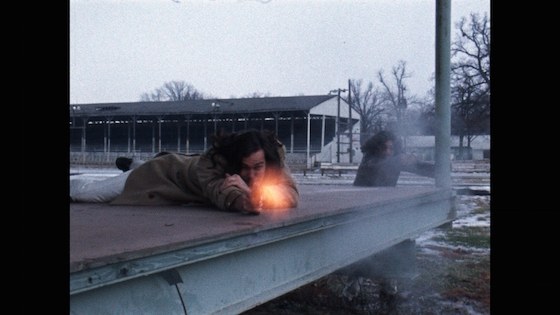 Shot, released in a very limited run at regional drive-ins as Death Shot, is an ambitious film made by some members of the University of Illinois. It’s writer and director, Mitch Brown, explains its origins in one of the NEW supplemental items on Vinegar Syndrome’s Blu-ray release of this obscure flick. He states that the bulk of the money was raised by setting up fees for movie screenings on campus. Whatever it takes, right? With very little funds, Shot took shape as a spotlight into the shady dealings of cowardly cops and seedy sleaze-bags. The story involves two friends, career detectives, trying to take down a drug lord and his violent cronies. Their partnership is tested as they go to extremes, sleeping with informants and whatnot, in their efforts to bring these longhaired hooligans down. They are at odds with the law, their superiors and, ultimately, with themselves but, as all good guys do, they come together in a stadium shootout to bring down all the baddies. Violent and full of solid characters, Shot is weighed down only by its inability to create tension. Sure, these “actors” are chasing everybody around with what appears to be lightweight cap guns, but there are some twists and turns that you may or may not see coming. The hallway scene in which an informant is completely gutted is a standout part of this flick. Shot is a film that relies on its DIY shenanigans to get to its violent ending and, for that reason, the film ought to be praised. It is weird but knows EXACTLY what it is out to do. Students of filmmaking will want to check it out; that’s how ambitious it is. Brown’s film is just left of center with its 1970’s era sleaze, too. It has character and tons of local color, which is always a plus, and remains engaged right up to its climax. Filmed entirely in rural Illinois, Shot rises above being just a simple curiosity item thanks to its earnest showmanship. Vinegar Syndrome earns major points for releasing this student film on Blu-ray. When it comes to student films, this Shot rises above the rest. Tagline: Where survival is the name of the game ... It's every cop for himself! Synopsis: Semi-urban detective duo Ross and Wilson have been charged with taking down local drug kingpin, Blasi. After busting a low-level pusher, they convince his girlfriend, Sheila, to start working for them as an undercover operative in exchange for avoiding prison. But as Ross finds himself becoming romantically interested in his new, perpetually spaced out informant, Blasi continues to strengthen his crime empire, setting his sights on even loftier, and deadlier, ambitions. It’s not polished by any stretch of the imagination, but Vinegar Syndrome’s handling of Shot is much appreciated. The sleeve says that the film, presented in a 1.33:1 aspect ratio, has been newly scanned and restored in 2K from the 16mm reverse original. Colors aren’t bold and the weather makes everything look cold and freezing which, if you ask me, is a plus. There’s few details in some of the bad suits, but the facial hair looks amazingly defined. Blood flows righteously through the smallest of wounds and, as a result, red is the color that looks the best. A 1.0 DTS-HD MA track brings the film to life. 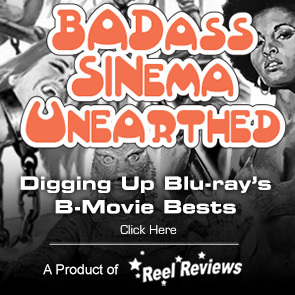 Vinegar Syndrome puts out a disclaimer about its pops and hiss but the track is fine. This release is punctuated with a NEW interview with writer/director Mitch Brown and Nate Kohn, the producer. Both spend about twenty minutes talking about the making of the movie and how the film came together, including its limited drive-in release.